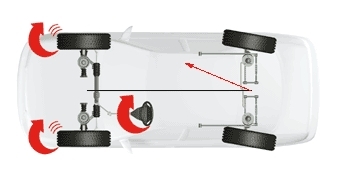 On this vehicle, the front wheels are not aligned to the rear thrust line. This can happen from normal wear and stress, whether your vehicle has adjustable or non-adjustable rear suspension. To steer straight ahead, you would have to steer the front wheels slightly to the right. A common result would be that the vehicle would "dog track" and possibly "pull" to the side. Of course, the angles are exaggerated so you can more easily see the condition. But it takes only a small misalignment to create problems. Fuel consumption improves as rolling resistance decreases. Total alignment sets all four wheels parallel which, along with proper inflation, minimizes rolling resistance. Does your car pull to one side? Does the steering wheel vibrate? Do you constantly have to move the steering wheel to keep your car travelling straight ahead? Many handling problems can be corrected by total alignment. With all the system components aligned properly, road shock is more efficiently absorbed for a smoother ride.